We love creating new baby clothes for you! 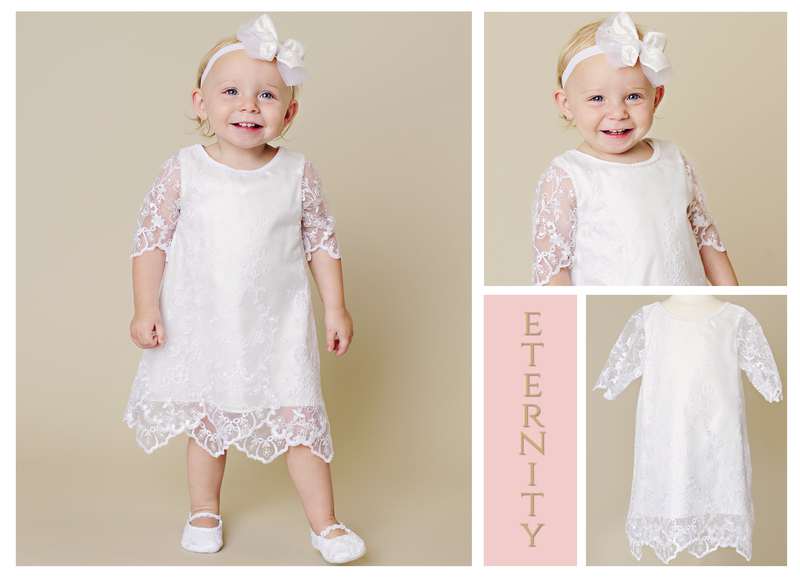 Today, we get to introduce our newest special occasion dress-the Eternity. This precious A-line was made especially for our owner/designer’s youngest daughter (isn’t she adorable) who wore it for a very special religious occasion. It is absolutely perfect for an older baby that is on the move. Katy specifically designed this dress for her walking baby. A simple scoop neckline and A-line shape allows exquisite embroidered netting lace to steal the show. And does it ever! Embroidered netting is a very delicate, open and light fabric that’s created by twisting, knotting, or weaving threads together at regular intervals. This process creates an absolutely gorgeous lace. The lace is showcased in the elbow-length sleeves and the extended hemline. We love the modern pointed scallops! 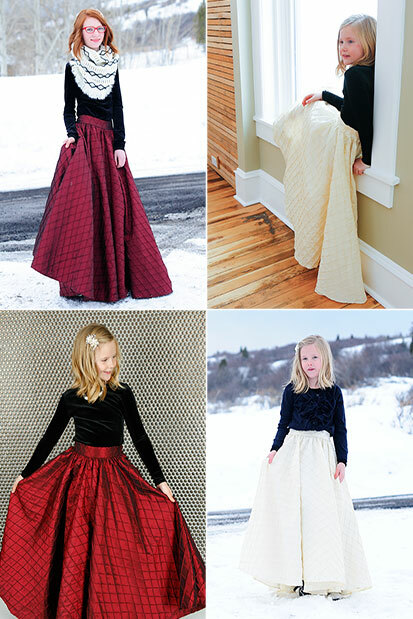 Katy selected an amazing diamond silk taffeta for the dress lining. It’s super soft and the subtle sheen is stunning. Covered buttons close at the back. 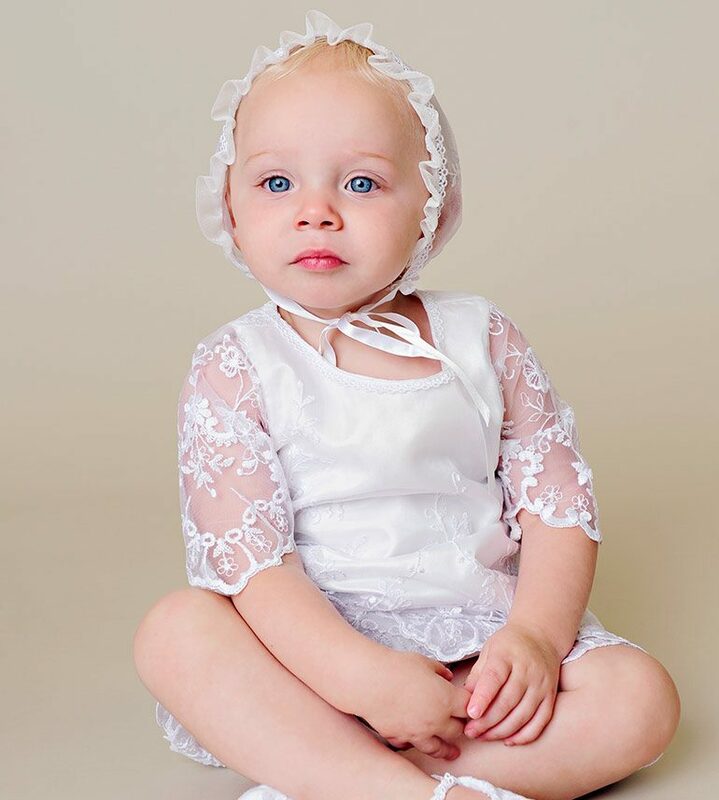 The Eternity lds blessing dress includes a pretty headband. It features a hand-tied bow made from diamond silk taffeta. Raw-edge netting creates a beautiful base and adds flair. It all rests on a comfy elastic band. Looking for more accessories to complete her look? We’ve designed a matching bonnet and slippers to complete her look. The Eternity bonnet is made from the same embroidered netting lace. It boasts a modern, slim ruffle brim with lace trim is a super feminine design. 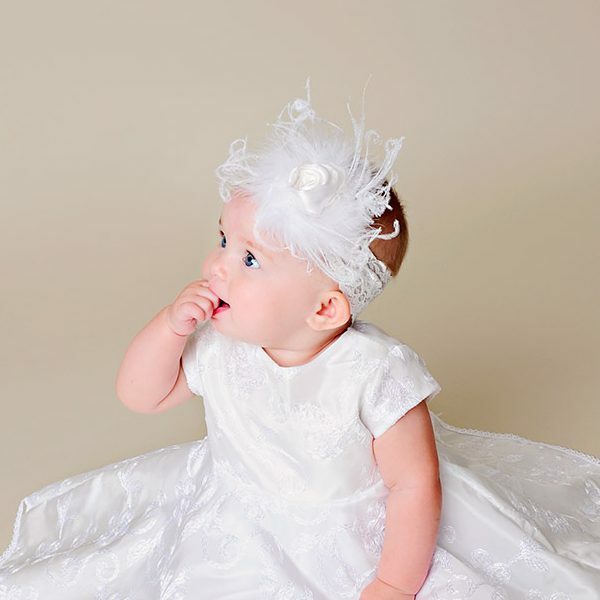 Thin satin ribbon ties comfortably secure the pretty hat at baby’s chin. The new Eternity Slippers are made to match using the same embroidered netting lace. These pretty crib shoes are made for comfort with a cotton flannel construction. A soft elastic band is gathered into a pretty ruffle, for a little feminine flair. You can purchase the Eternity Bonnet and Eternity Slippers separately. This gown and accessories will be available as a limited edition. 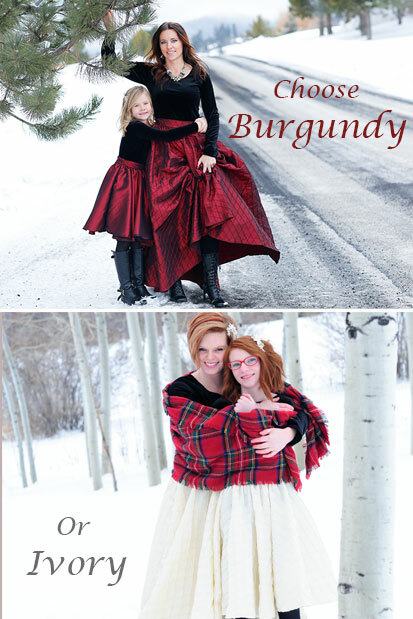 This dress is perfect for any special occasion. 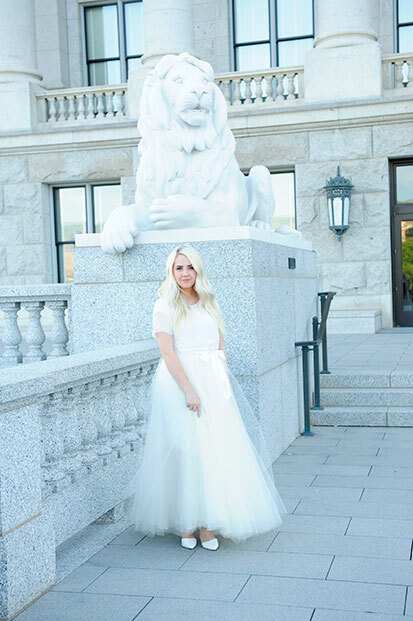 Purchase the Eternity LDS Blessing Dress. Lovely raw-edge chiffon flowers. Three layers of shimmering tricot. A splash of colorful satin. 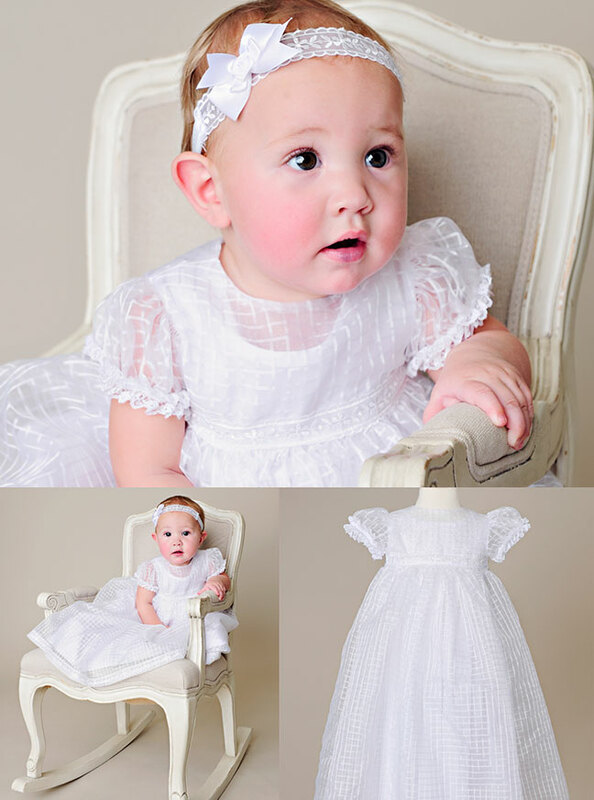 Our newest Christening dress is super chic! The Piper is perfect for your summer party! 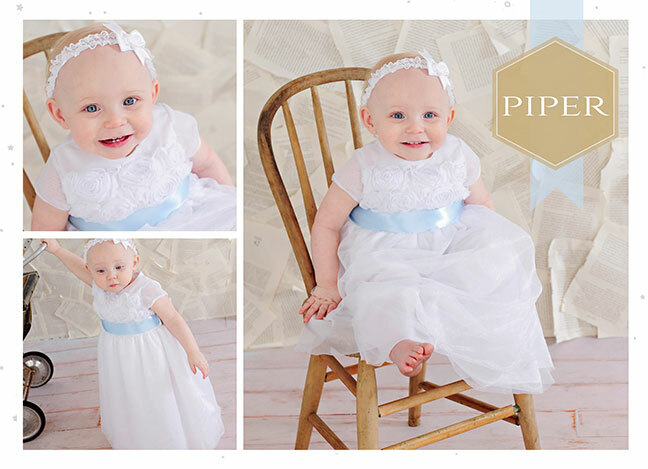 Our newest dress is fit for an angel! The Piper is a simple A-line design with gorgeous details. A bouquet of chiffon roses makes a beautiful bodice. There are three rows of these pretty raw-edge flowers. The sheer cap sleeves are comfortably soft, so they won’t restrict her range of motion. 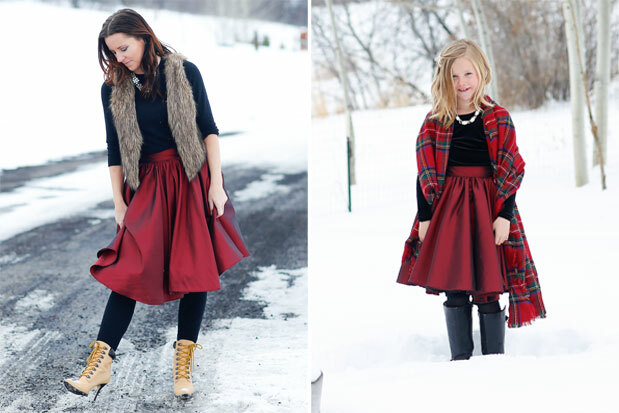 Three layers of silky tricot make for a shimmery skirt. We love how gracefully the raw edges sweep the floor! Let her personality shine through with a colored satin sash. Tie it at her back or put the bow in front! Choose from pink, coral, baby blue, lavender or white. The sash is belted with subtle loops under each arm, so it won’t slide down. The Piper dress is super comfortable! It’s made from Chiffon and Tricot. 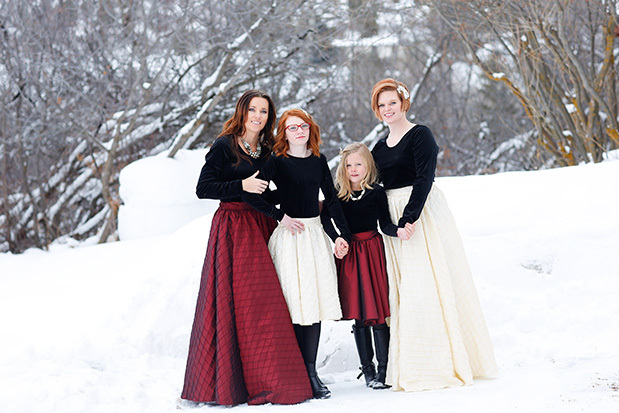 Each are soft and breathable fabrics. Not to mention super light-weight. She’ll feel like she’s wearing a cloud! Plus, no restrictive stiffness. Three simple buttons do up the back. 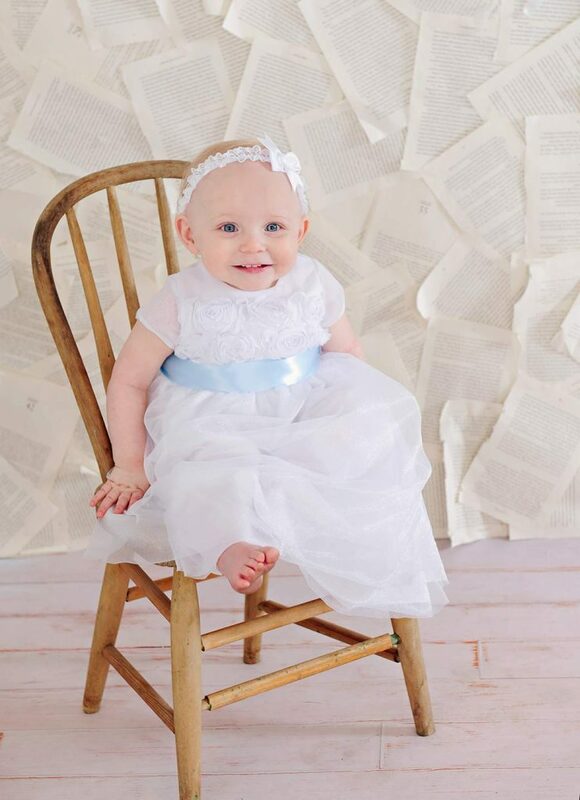 Our adorable Piper dress is shown above with our Rose Bow Headband. Add our Day-Length Slip and Lace Ruffle Satin Slippers. 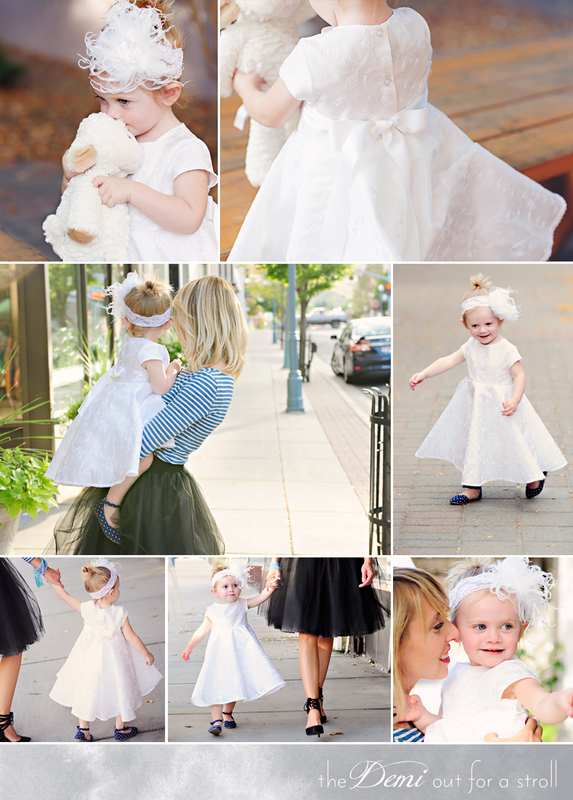 Her gorgeous summer Christening outfit is complete! 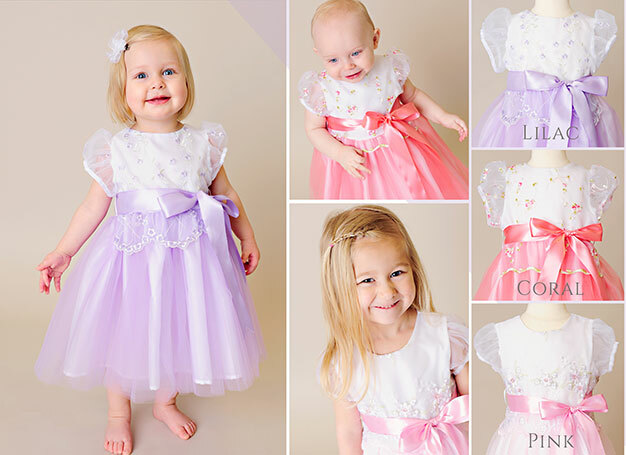 Have you seen our girls Communion dresses? 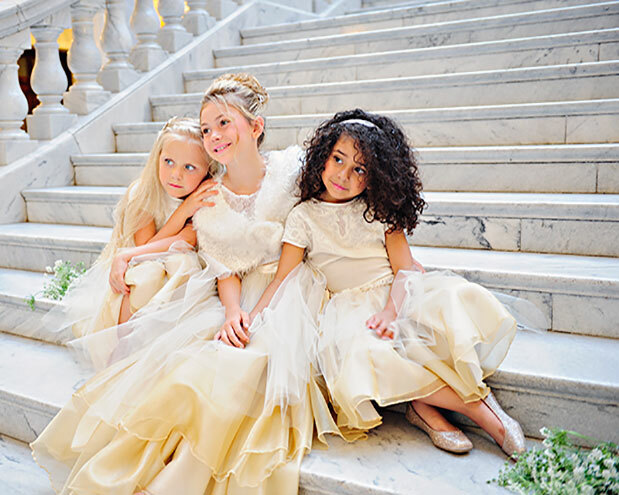 Each is fit for a princess and designed to make her big event extra special. 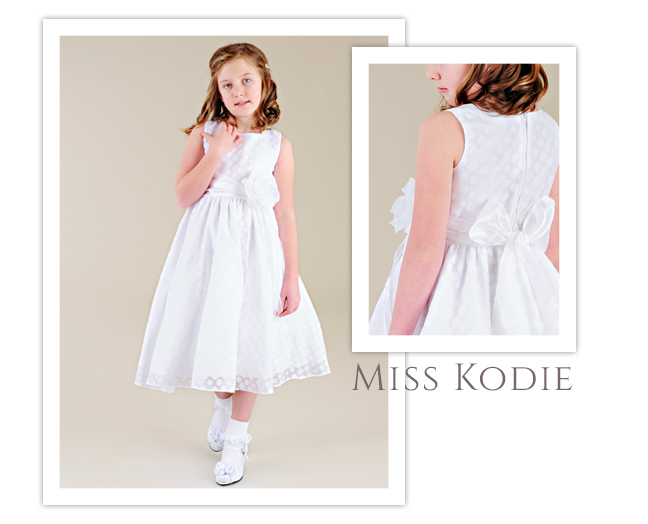 Today, we’d like to highlight one of our favorite girls Communion dresses: Miss Kodie. 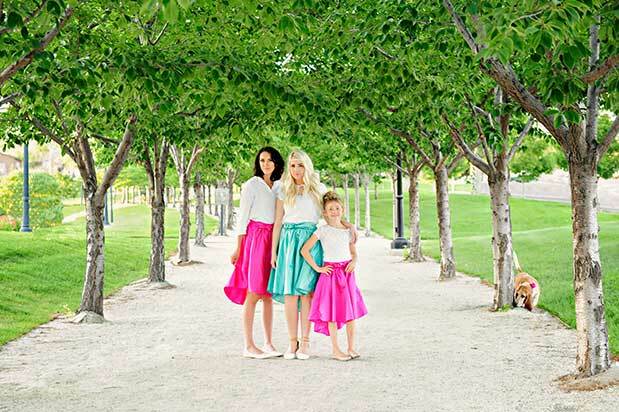 It couldn’t be more perfect for her spring or summer occasion! This sleeveless dress features a large polka-dot print. She’ll love the large silk flower and wide sash tie. They make a cute, flattering statement at the waist. 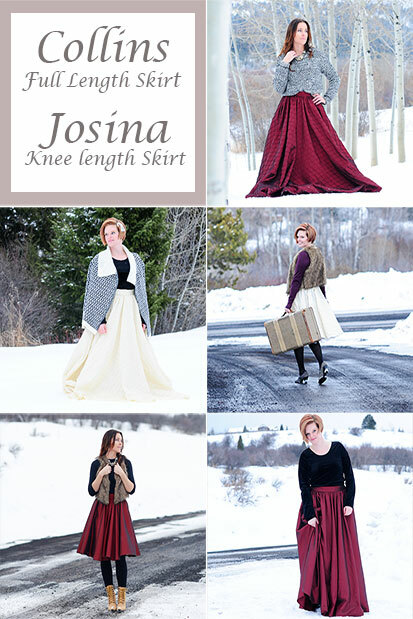 The classy A-line structure gently flares into a tea-length skirt. You’ll appreciate the modest scoop neckline and easy zipper-back closure. The lightweight material will keep her comfortable in warm summer weather. Take it from us. This dress is absolutely delightful! Complete her summer look with our Voile Flower Comb, Pleated Satin Jacket and Nancy Shoes.